Do you feel like there are always repair and maintenance projects that need to be addressed in your home? It can be fulfilling to work on home improvements, helping you create the perfect living environment for your family. If you live in Hillsboro Beach, FL or the surrounding areas, then we invite you to talk to our team about the benefits of new window coverings. Shutters, shades, or blinds might be the answer that you need to improve the appearance of your property. These investments not only impact the style of your home, but they also have a positive effect on the function of your windows as well. If you want an affordable way to improve your home, then you need to schedule a consultation to learn about the options. It doesn’t matter if you are sourcing the cheapest blinds or the highest-quality shutters, we are always here to answer your questions. You are welcome to visit our office and showroom to see examples of the products. Or, we will schedule an in-home consultation for your convenience. Take a moment to assess the overall appearance of your property. Are you creating the right first impression when people view your home from the street? What do friends and family think when they come inside? Old window coverings are dragging down the appearance of your home. If the blinds are damaged, faded, or broken, then you need to replace them right away. Choose timeless, classy products that will look good for many years, despite the changes in style and home fashion. Did you know that furniture and carpet can be damaged by UV rays from the sun? When the sun shines through your windows, then the light could be fading the fabric in your home. This damage is gradual over time, eventually causing you to replace the flooring or furniture. One solution is to install quality window coverings that give you control over the sunlight in each room. For example, you might choose blinds or shutters that can be opened partially. Cracking the slats on the blinds will bring in a little bit of light, without causing direct exposure during certain times of the day. Do you feel like the neighbors can see into your living space? If you are uncomfortable with your daily activities being visible through the windows, then you need the right blinds, shutters, or shades to cover the glass. These products improve your privacy and lower the risk of strangers or neighbors peering inside. As a result, you can relax in your home without feeling worried about the visibility. You always have the option to open the window coverings when you want to bring in more sunlight. Another benefit that you can expect from new window coverings is an improvement in the curb appeal of your home. If you change the blinds now, then you can ask for a higher price tag when you want to sell. It is important that you set a good impression when potential buyers come to visit. Curb appeal matters even if you aren’t going to list the property on the real estate market. Managing the appearance of your home will help you set the right tone when friends and family come to visit. Another factor to consider is the energy efficiency of your property. When you are running the air conditioner, it is likely that you are losing cool air through the windows. The right window coverings can add the extra insulation needed to minimize thermal transfer. As a result, you will decrease your energy usage and cut your utility bills. The best solution for energy efficiency is to improve the quality of your windows and window coverings. 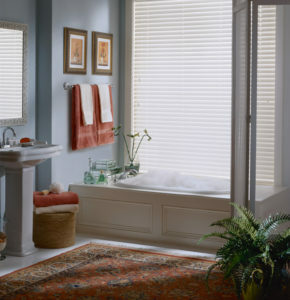 But, blinds, shutters, or shades are a great place to start if you don’t have the budget for new windows. Right now is a great opportunity for you to learn more about the window covering industry. If you have questions, then it is a good idea to schedule a consultation with our team. We will discuss your preferences and help you choose products to match the needs of your family.